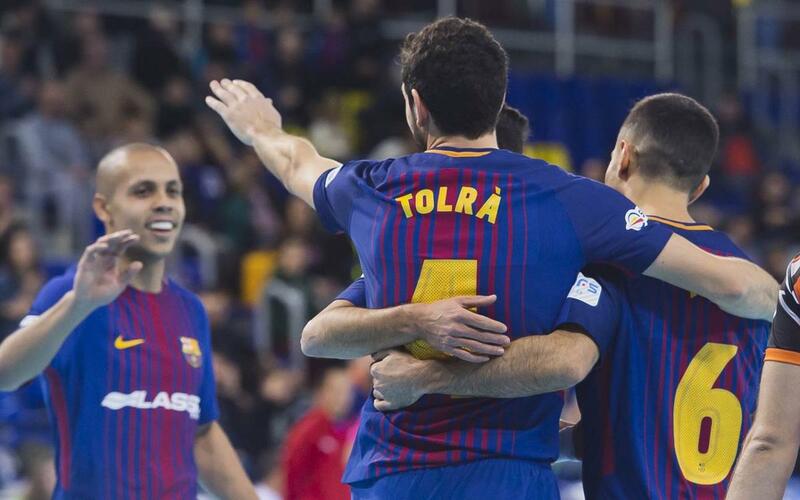 Andreu Plaza’s team totally dominated Ribera Navarra and continue as League leaders FC Barcelona Lassa took the honours in a game which they dominated from start to finish and in which their opponents were overwhelmed by Barça's superiority. Ferrao, Plana (OG), Santana (2), Adolfo and Rafa López were on target for the hosts. The game started with constant home pressure and after only three minutes, Ferrao opened the scoring. Both Rivillos and Adolfo would go close early on, but it would take an own goal from Ferran Plana when trying to clear a corner, to increase Barça’s lead (2-0 min 10). Despite the slowness of the Navarrese, which the hosts appeared more than capable of dealing with, Rubi was able to reduce the deficit. That only served to see Barça Lassa move up another gear, Santana scoring twice in two minutes after the break to swing the game back in Barça’s favour once more. Visiting goalkeeper, Cuxart, was sent off for a second bookable offence, and his replacement, Gus, had hardly been on the pitch before Adolfo made it five (min 33). Rafa López would increase the lead further near the end of the game when he received a pass at the death from Adolfo (min 39).